After three days where players seemed to be learning and evolving their strategy at the tournament it was Jesse McEuen who emerged victorious, topping a field of 714 players. It was his first ever final table and he seized the day as well as the bracelet. Arthur Pro lasted just seven hands after the resumption of play today, getting it in good with versus Rhys Jones, who had shoved with . Pro hit his ace on the turn, but the river brought Jones a queen-high-straight to send Pro out in ninth and $16,145 to take home. There followed a flurry of eliminations as - in the space of four hands - Jeremy Joseph went out in eighth ($20,704), Herbert Yarbrough in seventh ($20,704) and Ryan D'Angelo fell in sixth ($35,143). The remaining five players would swap chips as they tried to out maneuver each other in the battle for the antes in the middle at the start of each hand. There were a number of double ups, making it anyone’s tournament. Adam Levy was eventually the player eliminated in fifth place for $46,575. Levy got it all in with on the flop of against the of Rhys Jones. The turn and river flush for Jones felted Levy. Again, it was Jones who dealt the fatal blow to the next player to be eliminated: Simeon Naydenov. Jones got it all in preflop with and Naydenov called it off with and was out in fourth for a $62,528 payday. That put Jones in the lead, but a succession of bad river cards for him saw his active approach to the three-handed game fail to pay off, and he was the next player out when he three-bet-shoved his short-stack, holding and got looked up by Jesse McEuen with . A run out of meant Jones would have to settle for third place and $85,131. Heads-up play between Jonas Lauck and Jesse McEuen started with pretty even stacks, but McEuen began to pull ahead by the time of the next break. When they returned, it was all over in one hand as they got it all in preflop. Lauck had a good hand with but McEuen had the better one: . A run out of and a winner was decided. 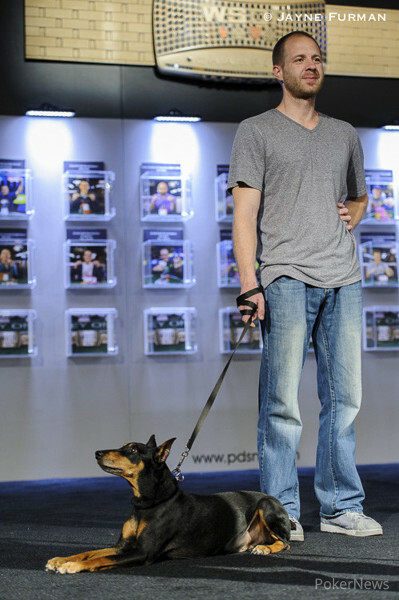 McEuen had his hands on $212,093 and a gold 2014 WSOP winner’s bracelet. Hand #167: On the first hand after the short break, Jonas Lauck bet 35,000 and Jesse McEuen raised him to 135,000. Lauck moved all in and McEuen made the call. Lauck had the but had been coolered by the of McEuen. The board ran out and it was all over. McEuen immediately went over to shake the hand of the vanquished Lauck before the celebrations began. Hand #161: Jonas Lauck brought it in and Jesse McEuen called. The flop came and they checked to the turn. Lauck bet 35,000 at the and McEuen folded. Hand #162: McEuen made it 35,000 and Lauck folded. Hand #163: Lauck made it 30,000 and McEuen folded. Hand #164: McEuen made it 55,000 and Lauck folded. Hand #165: Lauck made it 30,000 and McEuen called. The flop came . Lauck bet 40,000 and McEuen called. The turn was the and Lauck bet 95,000. McEuen moved all in and Lauck folded. Hand #166: McEuen brought it in. Lauck made it 30,000 and McEuen called. The flop fell . McEuen checked and Lauck bet 40,000. McEuen called and the turn came the . McEuen checked and Lauck bet 100,000. McEuen called. The river was the . They both checked and McEuen showed the . Following the hand, the players went on a 17-minute break. Hand #156: Jesse McEuen brought it in and Jonas Lauck raised to 40,000 and took the pot. Hand #157: Lauck brought it in, McEuen raised to 75,000 and took the pot. Hand #158: Lauck got a walk. Hand #159: Lauck made it 30,000 and McEuen called. The flop was . A 40,000 bet from Lauck got called and the turn was the . Lauck bet 80,000 and McEuen called. The river was and Lauck went for chips betting 140,000, McEuen raised to 370,000. Lauck stared at the board and wrung his hands before calling and getting shown the nut flush of McEuen. Hand#160: McEuen brought it in and they saw a flop of [ 8d 5d 3c]. Lauck bet 25,000 and got a call. They checked the turn and river . McEuen won with . Hand #151: Jonas Lauck brought it in for 5,000 and Jesse McEuen called. The flop was the and Lauck bet 40,000. McEuen folded. Hand #152: Jesse McEuen made it 20,000 and Jonas Lauck raised to 70,000. McEuen called and the flop came . McEuen checked and Lauck bet 80,000. McEuen folded. Hand #153: Jonas Lauck made it 30,000. Jesse McEuen called and the flop came . Lauck bet 35,000 and McEuen called. The turn was the and Lauck checked. McEuen checked and the river was the . Lauck bet 150,000. McEuen called and they chopped with both playing the board. 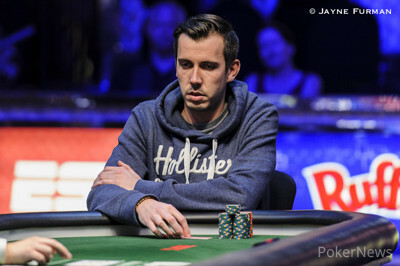 Hand #154: Jesse McEuen made it 60,000 and Jonas Lauck folded. Hand #155: Jonas Lauck made it 30,000 and Jesse McEuen called. The flop came . Lauck led out for 40,000 and McEuen called. The turn was the . Lauck checked and McEuen bet 80,000 to take it down. 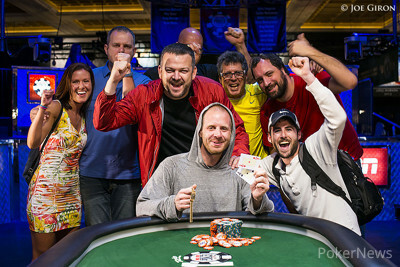 Hand #146: Jesse McEuen bet 75,000 and took the pot. Hand #147: Jonas Lauck brought it in and McEuen called. They checked to the turn which saw a bet of 35,000 from Lauck and then a raise to 70,000 from McEuen which was called. The river was the . Lauck checked and McEuen checked. The won it for Lauck. Hand #148: McEuen bet 65,000 and won the pot. Hand #149: Lauck brought it in. The flop was . Lauck bet 35,000 and McEuen raised to 135,000 and won the pot. Hand #150: McEuen brought it in. The flop was . McEuen bet 35,000 which got a call and the saw the turn which was checked. McEuen checked again on the river and Lauck bet 110,000. McEuen laid it down.